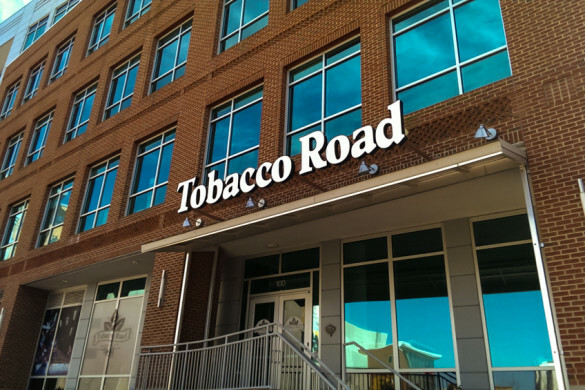 This article was originally featured as an On The Road review from the Charlotte Burger Blog on July 3, 2014. 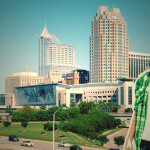 Location: Fayetteville Street, Raleigh NC. Why were you in Raleigh? Mrs. Angus and I find ourselves traveling around the state more and more. Especially during the summer. With her being a teacher 1, she has most of (I emphasize the most of) her summers free. So we go off on what my son Small fry likes to call his “Adventures”. 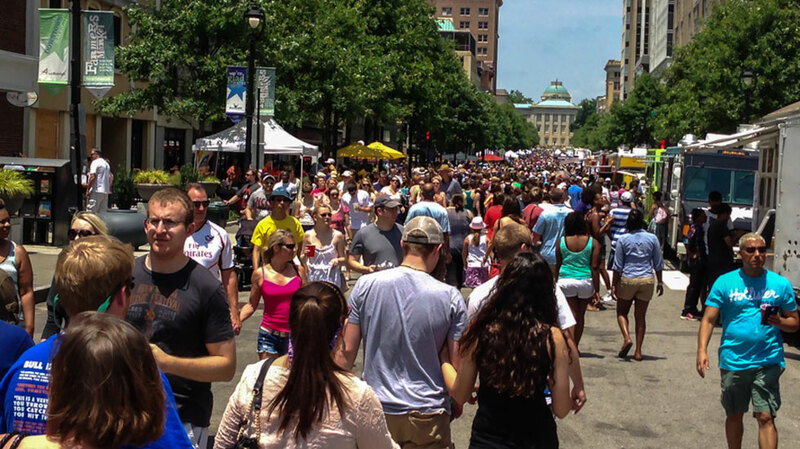 This adventure found us traveling to the Triangle to check out the massively huge Downtown Raleigh Food Truck Rodeo. I know what you are thinking and I thought it too. I did not see people riding on top of food trucks for that glorified 8 seconds or did I see anyone try and rope and take down a food truck. What I did see was a half mile slammed with over 50 food trucks from across the state. That’s a lot of food trucks. You’re telling me! 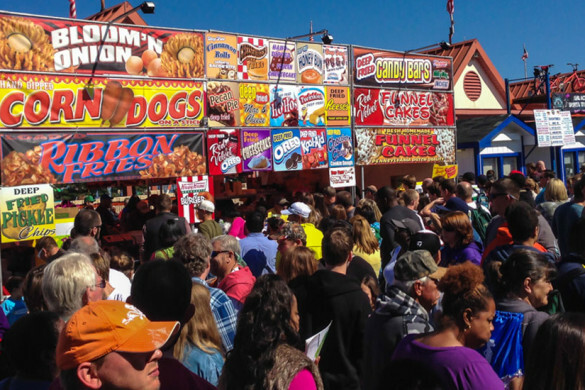 You stand at one end and peer down the street and it kind of overwhelms you to the point that you might as well eat nothing since you are not going to be able to choose just one thing 2. Ha. no. Haha. There was a burger food truck here that I have been dying to try out, so we had to find it. But, if by chance during our adventure quest, something caught our eye that we wanted to try, we would go ahead and do that to. 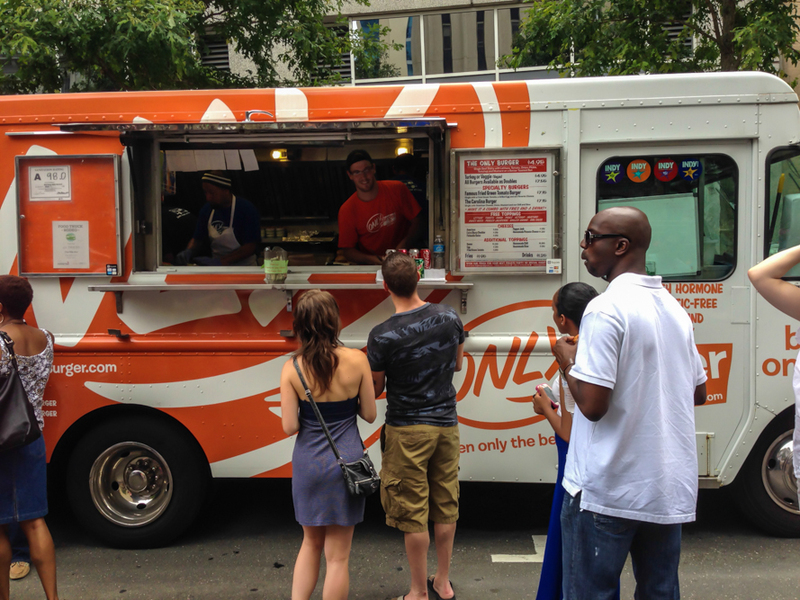 So what food truck stopped you first? Well, being the half-mexican that I am and being from California, I had to stop at a taco truck. And the first one we saw was Sol Tacos. This food truck makes their tortillas fresh and by hand everyday. They also locally source all of their ingredients and the only herbs they use come from their own garden! 3 What was a double bonus was that they had a burger themed taco on the menu called the Cheddar Chuck Burger! So we got that along with a Chicken Nachos Taco. At 4 dollars a taco they had to be the most expensive tacos I have ordered from a food truck. Again, being from California, I am used to the dollar tacos I used to get from the guy on a bicycle down the road. 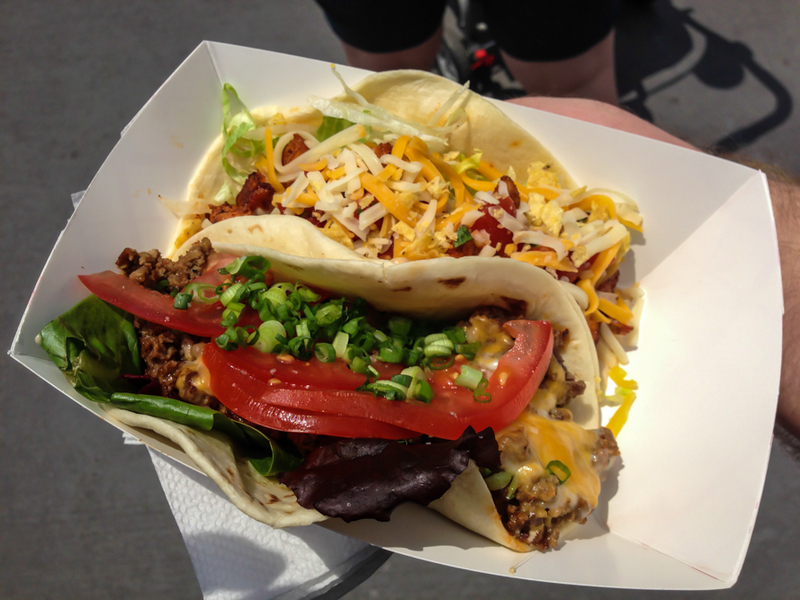 With that said, this was probably the freshest taco I have ever tasted (outside of my grandmothers kitchen of course). 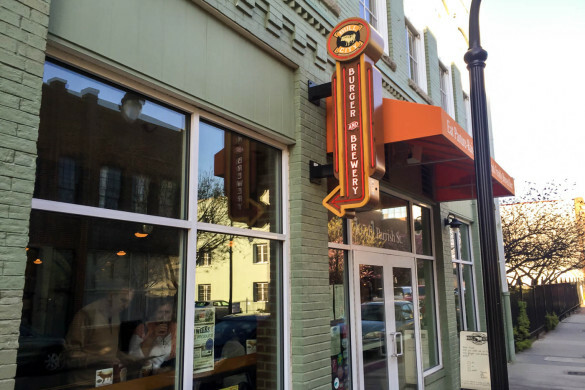 The Cheddar Chuck Burger was just that. The only difference was that it was wrapped in a tortilla. It was pretty amazing. What was the next truck? Well it wasn’t a truck per-say but more of a tent. We had to wash down that taco goodness with something. So we picked Raleigh Brewing. Mrs. Angus got her usual IPA in the form of their House of Clay Rye IPA and I got their Hell Yes Ma’am Belgian Style Golden. 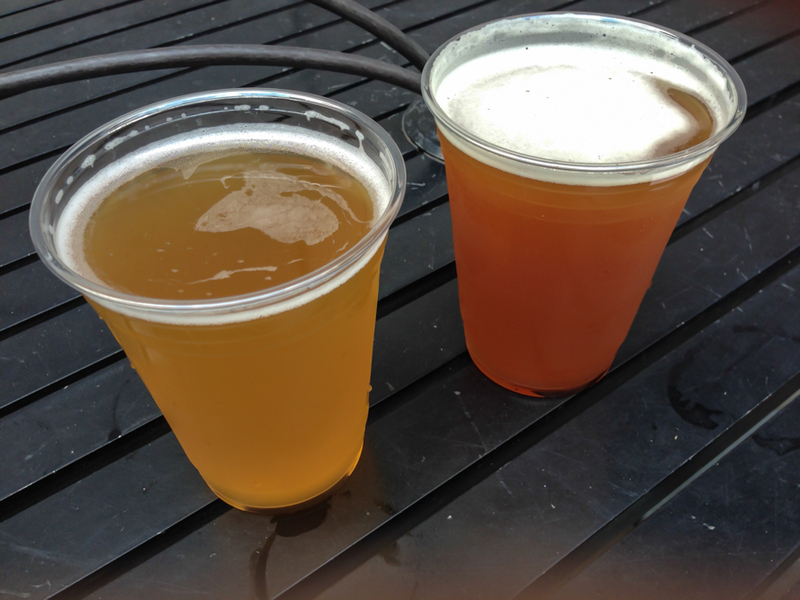 Both were quite tasty and refreshing 4. NICE. 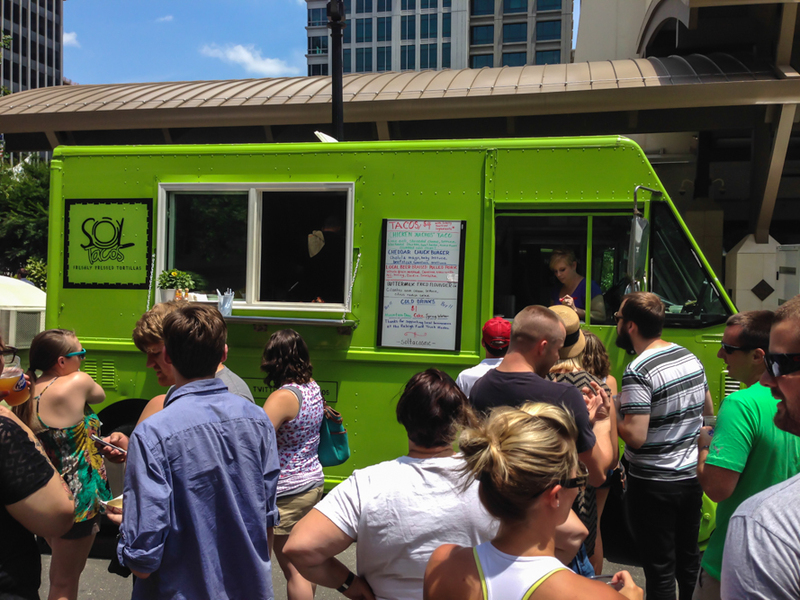 So what other food trucks did you try? Well still on our journey to find the fabled burger food truck, we came across a couple more trucks we had to stop at. And both were equally disappointing. I know. It does. It totally does look like Hamburger Helper 5. And You know what? It totally tasted like it too. I was pretty upset. 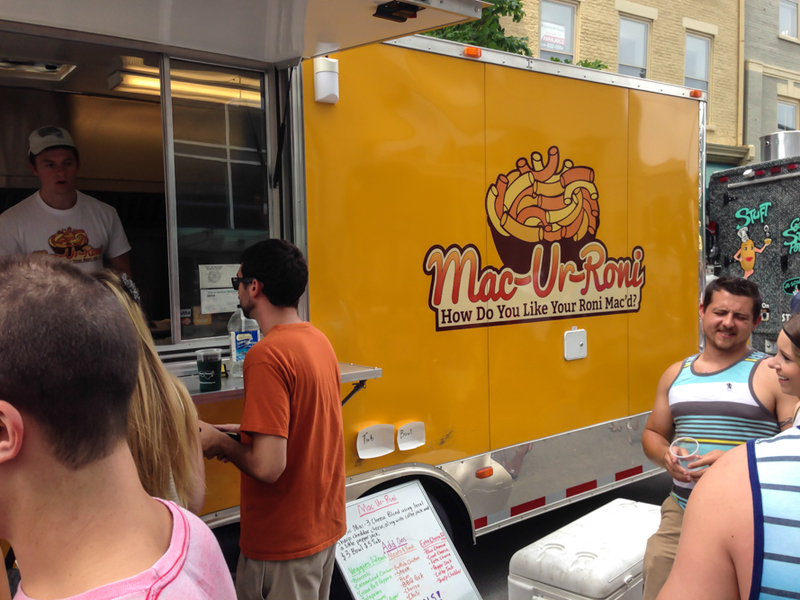 I mean if you have a macaroni themed truck at least BAKE your mac and cheese. We didn’t waste much since Small Fry devoured this (which is not saying much, he’s only 3 years old. Mac and Cheese is like crack cocaine to them). 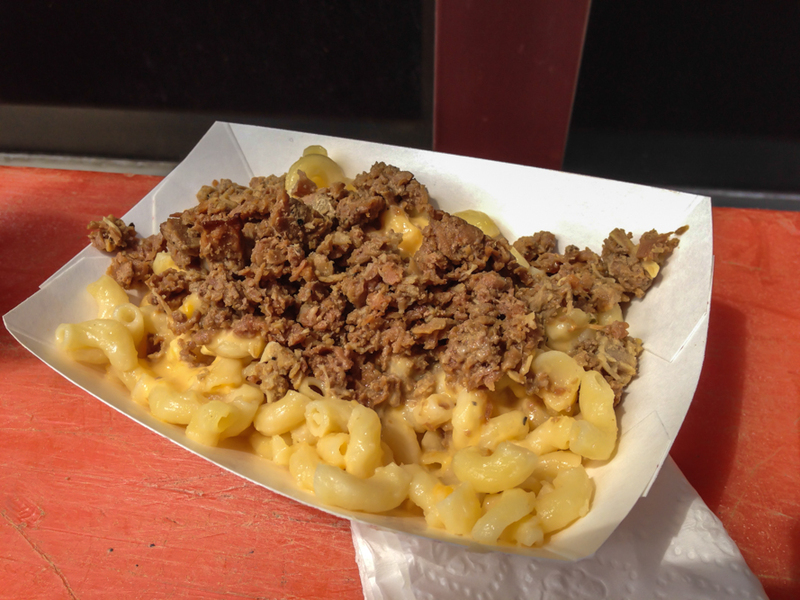 But to me, my Roni was totally not Mac’d. What was the second disappointing truck? 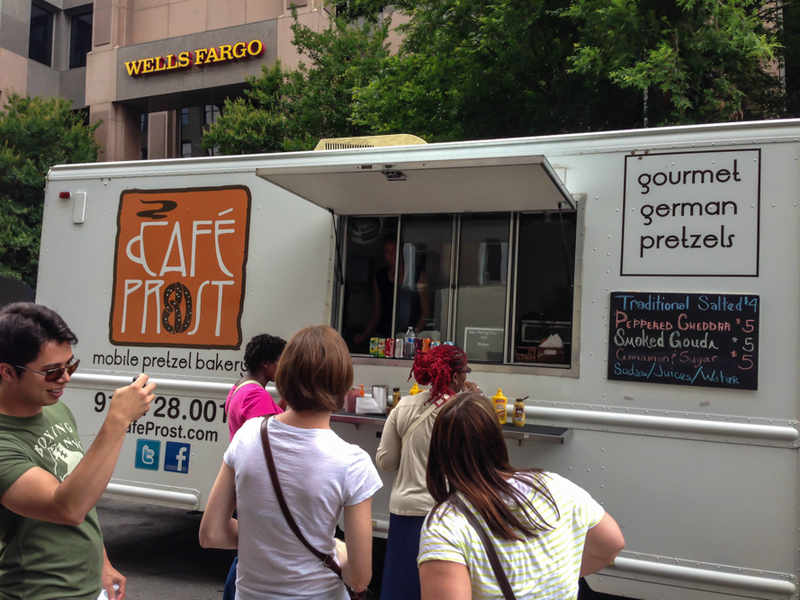 That truck happened to be a pretzel themed truck called Cafe Prost. Pretzels? Heck yes! Sign. Me. Up. So looking at the menu we figured we would definitely go with the smoked Gouda pretzel. At five bucks it has to be good right? 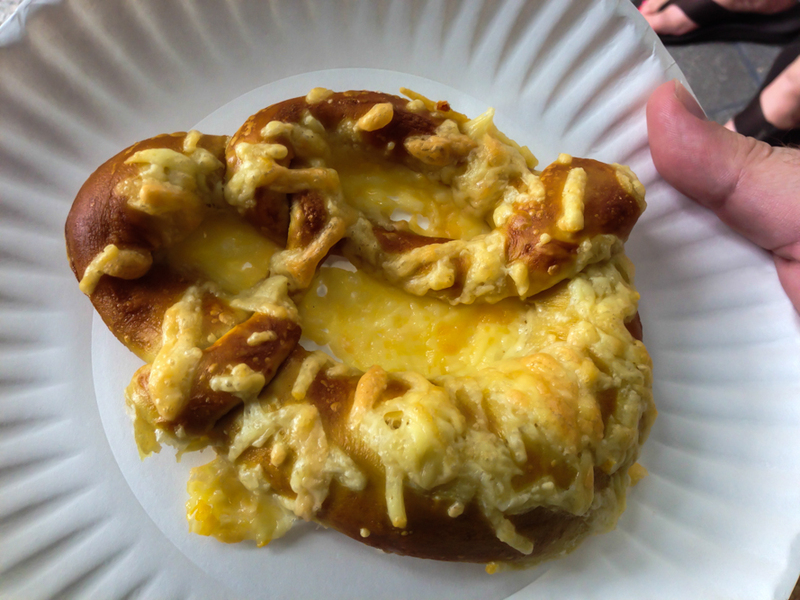 They literally took a regular pretzel and sprinkled f’n shredded Gouda on it. I thought that MAYBE we would get a Smoked Gouda filled pretzely goodness. But No. We got that. I freaking can do this at home in the freaking microwave. And it tasted like I did also. 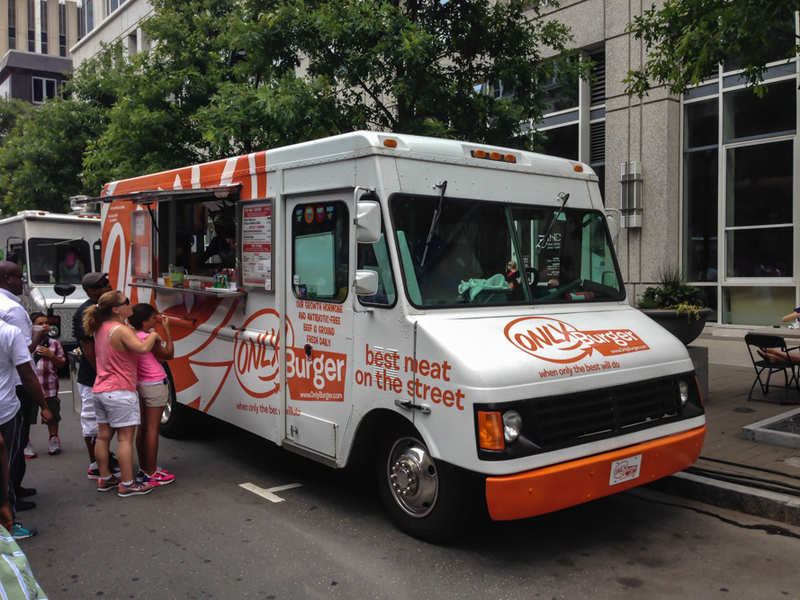 So after all the heartache, did you finally find that burger food truck? Yes. And it was glorious. So the food truck I found is aptly named Only Burger. This truck got started in the fall of 2008 and hasn’t stopped since (well it has to stop to serve it’s customers but you know what I mean!). 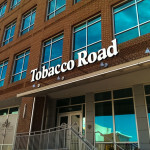 Since then they have opened up a brick and mortar store with a second being planned for The Great American Tobacco Factory in Durham. 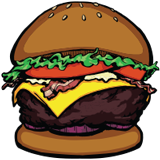 Only Burger’s burgers are made to order the second you do and are ground fresh daily using only Montana-raised antibiotic and growth hormone free beef sent directly from their local butcher. They have been on the media circuit being featured in The New York Times, The Food Network, and Martha Stewart Living just to name a few. So as you can tell, I was pretty excited about trying this burger. We got in line and Mrs. Angus did note that the two longest lines that we have been in were the lines for Sol Tacos and Only Burger. I took this as a good sign. Up at the counter I ordered their standard burger named The Only Burger (obviously) which came with lettuce tomato and ketchup but then I added extra sharp cheddar and bacon just to round things out a bit. First thing about this burger is that it was pretty massive. 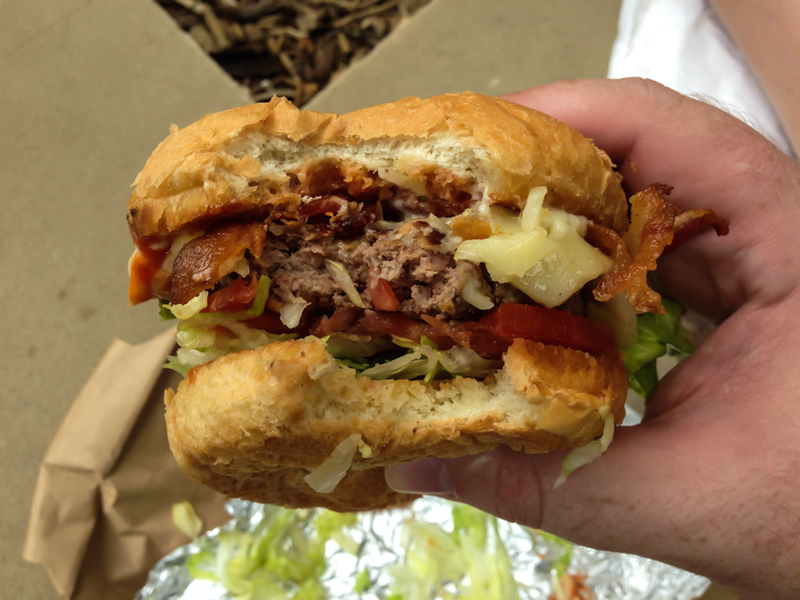 For a $5+ food truck burger it rivaled the size of burger we saw at Al Mike’s and The Liberty. Biting into it was definitely the highlight of my day. 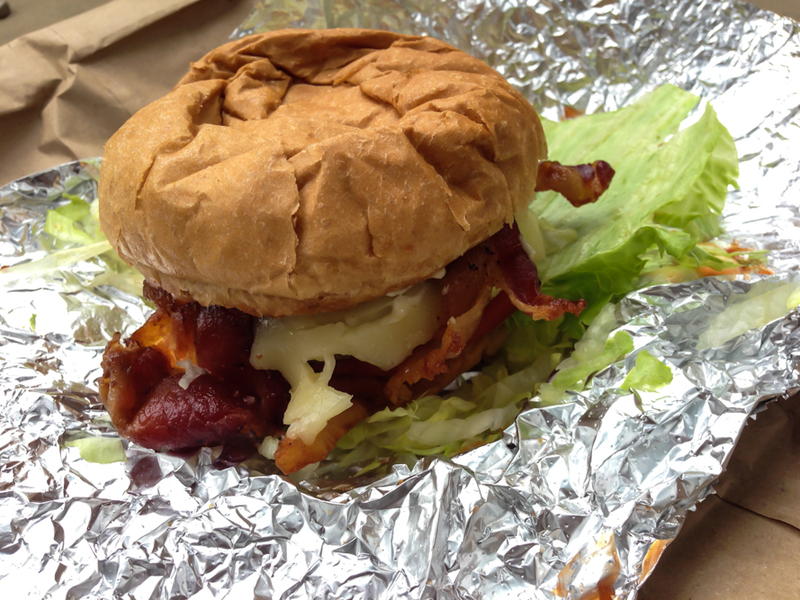 There was a plethora of shredded iceburg lettuce, two thick slices of meaty bacon, fresh baked buns, and white cheddar. I am not sure if it is the color or not but if cheddar cheese is of the white variety it will always taste amazing. The tomato on there tasted like it was picked that day from all the juice that came out of it. We have said this before in previous reviews but I think you can actually taste the difference in super organic beef, and this burger was no different. It was juicy, fresh, and tasted great. So when will you be back? The next time we are around Raleigh, I will make it my mission to hunt down this truck. I need this burger again. I will find it and I will eat it.